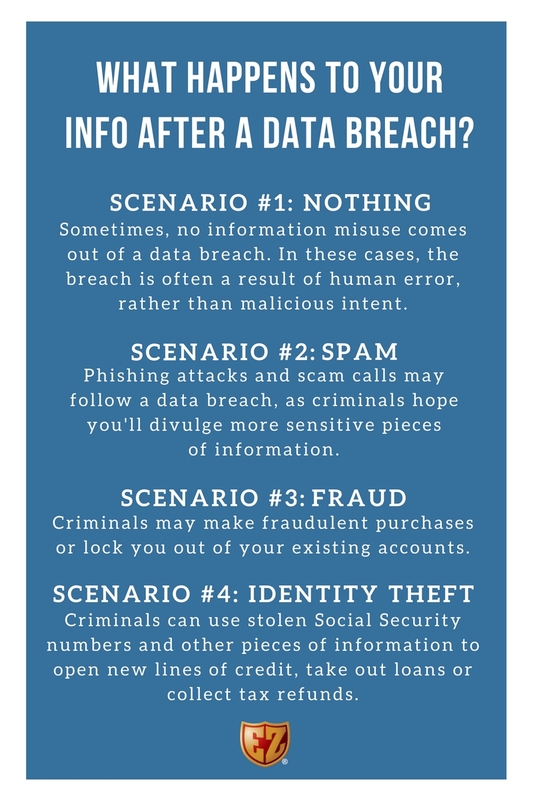 News & Education / What happens to your information after a data breach? Data breaches have become all-too-common amongst retailers, businesses, educational institutions and health care facilities. Last year, 1,093 data breaches led to more than 36 million compromised records in the United States, leaving millions of Americans’ personal information exposed. Notification triggers can be a particularly grey area for breach notification laws. Most states play it safe and notify customers when personal information “was or is reasonably believed to have been” compromised. But, some states allow companies to first determine the risk of the exposed information before notifying impacted individuals. Other states have no specified method of determining exposure risk, but an investigation is usually opened immediately regardless of individual state statues. Email/Phone Number: Be aware that you may be targeted in phishing emails or scam calls in an attempt to steal more sensitive information. Avoid falling for these scams by contacting the breached organization directly with questions about the event; be weary if you receive emails and phone calls about the incident. This article originally appeared in Fighting Identity Crimes. This article was written by John Burcham from Business2Community and was legally licensed through the NewsCred publisher network. Please direct all licensing questions to legal@newscred.com.